Breaking All the Rules and Eattin' Good! For good eats you will either make it into a soup by putting the canned mix into a beef broth base and adding pasta and cooking (about 2 cups of pasta per quart jar) until pasta is done OR by cooking your choice of pasta (about 2 cups per quart jar) and ladling your canned Italian mix over it including the juice/broth from the jar. Each quart jar makes a hearty 2 person serving. You know what to do to get your jars ready! boiled for 2 minutes, sit for an hour if you do it any other way you will wind up with MUSH!!! Prepare your choice of beans according to pack for the ‘quick’ soak method. Do not use the overnight method! I have found this will cause mushy beans as too much water is absorbed. Basically you are putting your dried beans into enough water, bringing to a boil for 2-3 minutes and then removing from heat to set to the side while you do the rest of prepping for this recipe. Cut up your Italian/Bratwurst sausage into bite size pieces and place into a large pan to cook. I typically use whatever type of this sausage I can find on clearance including turkey sausage. Cook it! Stop short of over cooking. You want to keep it from hard browning (crispy) but cook it! While you are cooking up your sausage bites get your broth going. You want this to be ‘boiling’ so that when you fill your jars you have hot broth to add. Now the easy part! Put your onions, tomatoes, garlic and Parmesan cheese and stir well. Drain your beans and add to your sausage mix. Stir/Mix well. Now add your powdered garlic and onion. Again MIX WELL. Typically I just wash my hands well and get right in there to make sure everything is mixed well spoons just don’t seem to work that well for me in such large batches. Now to the fun part! Get your hot canning jars out and evenly distribute your sausage mix into the 7 quart canning jars. Ladle your hot beef broth into the jars to 1 inch head space. Be sure you use a knife to stir each jar to make sure you get the air out and the right amount of broth in each jar. Wipe rims, put the lids on and put into your canner for 70 minutes processing time. You know what to do next! 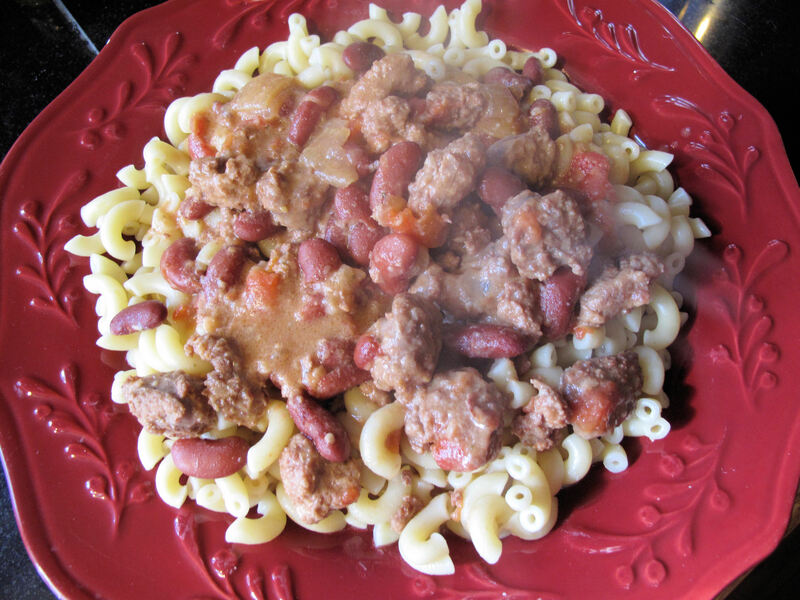 There are a couple of ways to serve this delicious dish, soup or pasta topping. See above. As always, make sure you bring this delicious Italian mix to a boil for a few minutes before serving over pasta of your choice. If making a ‘soup’ no worries! You will heat this up enough by cooking the pasta. One note: if you are making a soup you will want to season to taste by adding additional garlic and onion powder. For this post I used macaroni (which was an interesting happening when I tried to get it out…let’s just say the container lid didn’t hold and I had a mess) but you can use whatever you have on hand. That is old style Italian…use what you got! Feel free to experiment using different types of meat. I would imagine this would lend well to any type of meat you have! Break the rules and eat good!